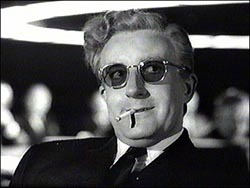 MD Blog > Dr. Strangelove – LEGO Style! Using LEGO and pure genius, YouTuber XXxOPRIMExXX created this amazing stop-motion homage to the great Stanley Kubrick film Dr. Strangelove or: How I Learned to Stop Worrying and Love the Bomb. The project was originally uploaded in 2010, but YouTube blocked part of it over copyright claims. Now you’ve read the news, let’s get down to business with the video -Part1 & Part2!